Today marks the last match of the second round in Streetsblog’s hyper-competitive Sorriest Bus Stop in America tournament. So far this week, bus stops in Broomfield, Colorado, and Kansas City have staked claims to shame in the Final Four. The victor of today’s match will take on the winner of Boston vs. Henrietta (if you haven’t voted in that one yet, the poll is still open until midnight). This one is on a busy state highway in Silver Spring, Maryland, immediately north of Washington, DC. Metrobus (which serves this stop) should get props for having great service – buses come every few minutes during rush hour, and service runs 22 hours a day, 7 days a week. That is, if you can actually get to this bus stop, and we’ve got the Maryland State Highway Administration to blame for it. There are no sidewalks leading to it. It’s at an intersection, but there’s no crosswalk and no stoplight. And, of course, there’s a steep hill next to it. I’ve lived here my entire life and I’ve only ever seen one person waiting for the bus here. I’m pretty sure they were dropped from a plane or something. I’ve used that Silver Spring stop many times and it is treacherous. Before that wall was there you had to stand on the hill. It’s across from my neighborhood and yes people use it. It needs a crosswalk and sidewalk. 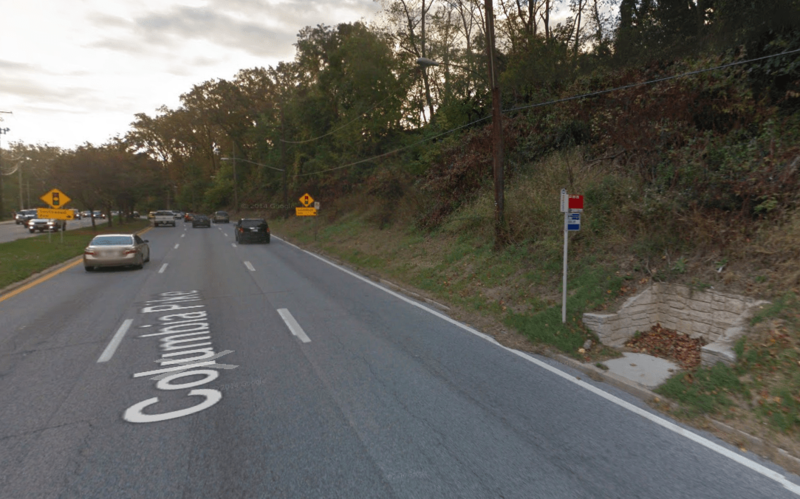 The Silver Spring Master Plan calls for building a sidewalk on that side eventually… between the previous bus stop at the bottom of the hill and the next bus stop at the top of the hill. Before there was a sidewalk on either side of US 29, I used to walk down the middle of the median in that area and when the traffic light on each end of that block is red, it is pretty easy to cross. Agency in charge: Maryland State Highway Administration. Nice bus stop in a ditch between Asheville NC and Black Mountain on 5-6 lane US Highway 70. Ridership has been so bad that the route is being reduced significantly. Maybe because the bus stops are in a ditch? This is route 170 served by Asheville Transit. Agencies in charge: North Carolina DOT, Asheville Transit. Here is a map of all the contestants with today’s matchup highlighted in green. Silver Spring got my vote because, 1) it is used; 2) one can walk along the side of the ditch. The hill, not so much. Everyone using this is crossing a very dangerous road right at the stop. If you look at Google Maps, the Silver Spring stop has no reason to exist. That neighborhood is served by three stops in each direction in less than half a mile. They should be consolidated into a stop with a shelter and a crosswalk, and the others eliminated. You can at least safely get to the bus stop in Asheville, not so the one in Silver Spring, which is less than a mile from my house. I have wondered why it’s there many times, there is a better one about 200 yards away. OH wow I am officially THE expert on these because I’ve lived in both places. And I can say Silver Spring wins out. I mean this is an awful stop, and to boot there have been issues with creeps stalking women around some of the other stops. This half mile of Colesville Road is like someone just ran out of space and said “F it.” It is also right near a nice park walking/jogging trail. What a shame I can’t walk down the trail and catch the bus. And just try walking that stretch of the highway with a small child (stroller? NO CHANCE). The Silver Spring ‘bus station’ is a disgrace. The Maryland State Highway Administration is at fault. While not as bad as the Silver Spring location, bus stops sited along both sides River Road in Bethesda, MD, near Ogden Road, flank a four way highway, are uncovered and unlit, and are dangerous to pedestrians. Indeed, an elderly pedestrian was killed attempting to cross River Road a short distance away. The Maryland State Highway Administration needs to be more responsive to the safety needs of pedestrians, bus riders and drivers. If Silver Spring wins the competition, the authorities won’t improve the stop, they’ll simply get rid of it. They’ll just force people to walk an extra block further. Which is fine. The stop at Eastwood is 900 feet away. In a suburban area, you want stops at about 1/4 mile spacing, unless there are trip generators like a shopping center or factory. Single family homes are not big trip generators for transit.